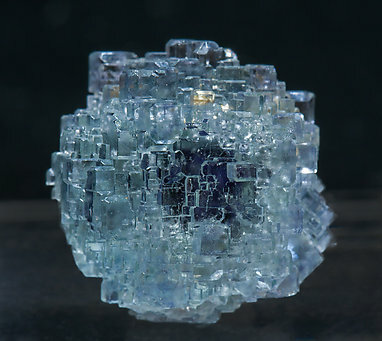 Polycrystalline growth of cubic Fluorite crystals finely beveled by the dodecahedron. They are transparent, bright and with a color between deep sky-blue and deep violet. It is from a unique find in 2011 in an abandoned mine where is very difficult to obtain new samples. Polycrystalline growth of cubic Fluorite crystals beveled by the dodecahedron. They are transparent and bright with a color that is between deep sky-blue and deep violet. 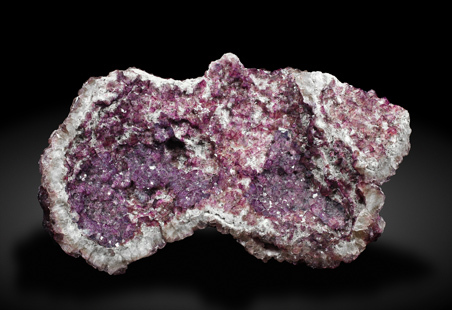 It is from a unique find in 2011 in an abandoned mine where it is very difficult to obtain new samples. Polycrystalline growth of cubic Fluorite crystals beveled by the dodecahedron. They are transparent and bright with a color that is between deep sky-blue and deep violet. It is from a unique find in year 2011 in an abandoned mine where it is very difficult to obtain new samples. 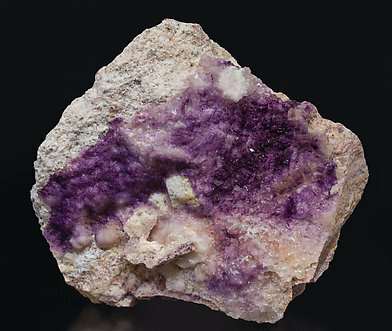 Druse of cubic fluorite crystals on matrix. 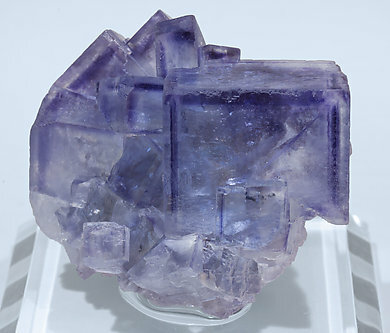 They are very transparent and have a neat geometric color zoning, very intense and deep violet on the edges and colorless in the rest of the crystals. 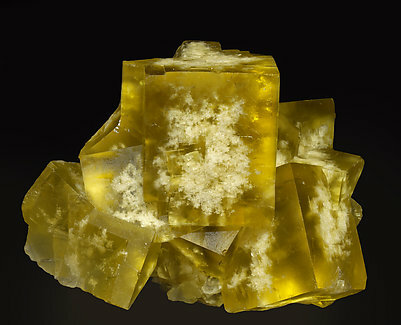 Druse of transparent cubic crystals with a pale yellow color, very bright, with unidentified green inclusions in some crystals and on a rocky matrix. The sample is from the Carles Millán collection whose computer card we’ll send to the buyer. 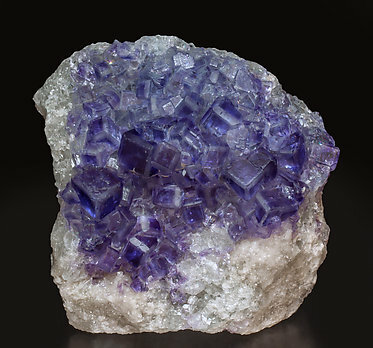 Groups of cubic crystals on matrix, beveled by smooth dodecahedron surfaces, transparent, extraordinarily bright and with a very intense and uniform violet color. With a great esthetic finesse. 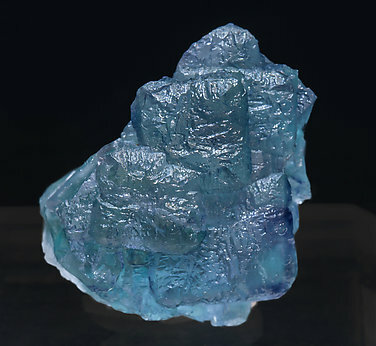 The sample has been very recently discovered in spite of the enormous difficulties that, currently, obstruct finding new Fluorite at the locality. 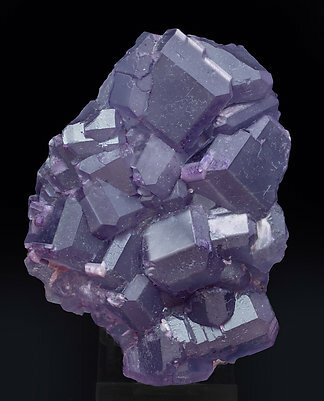 Druse of cubic and very sharp Fluorite crystals that are transparent, bright and have a color change from pale lilac to deepest violet. 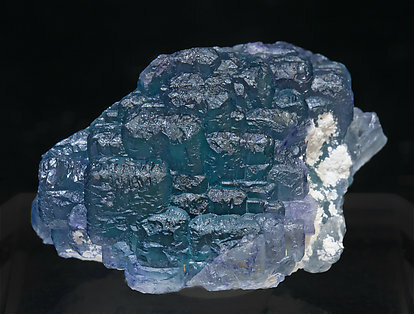 It’s important to note that Fluorite is a rare species at this locality, very well-known for classical samples of Topaz, Bixbyite, red Beryl and Pseudobrookite. A novelty at Tucson 2018. 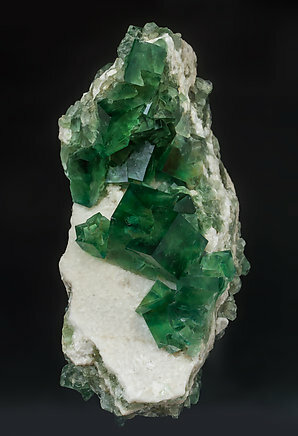 A group, on matrix, of cubic Fluorite crystals, between translucent and transparent, with a very deep green color and marine-blue dichroism, not intense but clearly visible in sunlight. The crystals are more individualized and complete than usual with such samples. 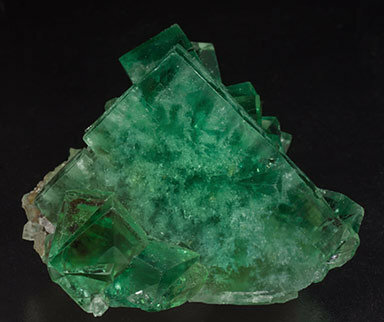 The locality is very new and even though Madagascar is a well-known mineralogical paradise there were no references to Fluorite occurrences other than the small crystals included in Quartz from Mandronarivo. Druse, on matrix, of cubic crystals prominantly beveled by dodecahedron faces. They are transparent, very bright, and have very well defined color zones, deeper on cube faces and clearer on dodecahedron faces. The sample is from recent finds at the La Viesca area. A novelty at Munich 2018. 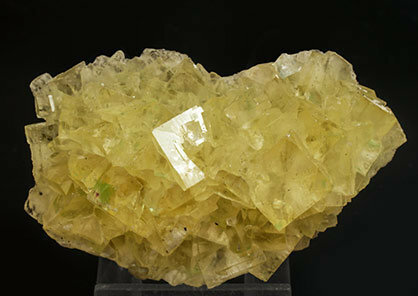 Aggregate of very sharp Fluorite crystals, translucent, with an intense yellow color and with white inclusions at the center of the faces. The sample is from a very recent find at the Sidi Ayad area. 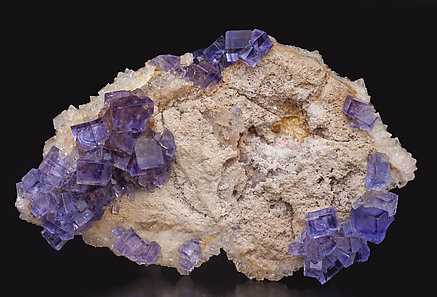 Group of considerably flattened cubic Fluorite crystals. They are transparent and bright and have very well defined geometric color bands. The sample is from a recent find. 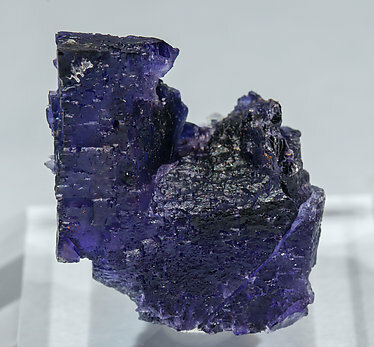 A crystal with polycrystalline growths and rich with skeletal and dissolution shapes, translucent, bright, and with a very intense and deep violet color. We note the scarcity of samples from the Codeceira mine. A picture of this sample has been published in the article “Vale das Gatas Mining District” in Mineral Up magazine (2017/1, pg. 21), it is from the collection of Pedro Alves, the article’s author, whose samples have been used to illustrate it. We’ll send the collection label to the buyer. 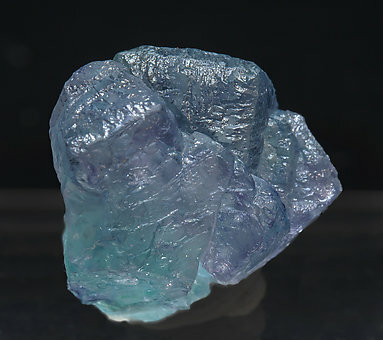 Cubic crystal with two very well differentiated growth phases, the first one a cubic nucleus with a very deep violet color, and a second, a peripheral polycrystalline growth, transparent and with sky blue color. The sample is from the collection of Pedro Alves, the author of the article “Vale das Gatas Mining District” in the Mineral Up magazine (2017/1). We’ll send the collection label to the buyer. Polycrystalline growth of cubic crystals finely beveled by the dodecahedron. 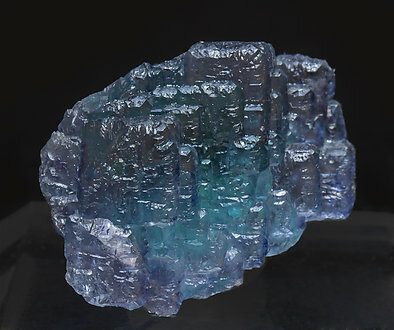 They are transparent and with a sky-blue color with irregular areas with a deep violet color. The sample is from the collection of Pedro Alves, the author of the article “Vale das Gatas Mining District” in Mineral Up magazine (2017/1). We’ll send the collection label to the buyer. A novelty at Tucson 2018. 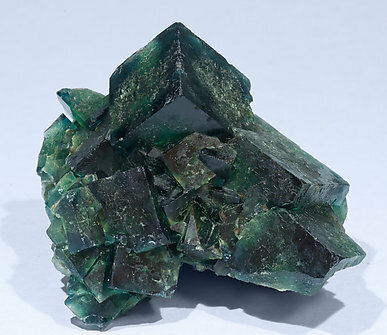 A group of Fluorite crystal cubes between translucent and transparent, with a very deep green color and marine-blue dichroism clearly visible in sunlight. 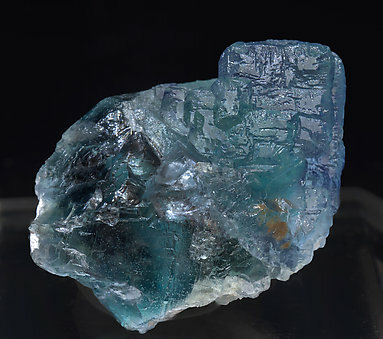 The locality is totally new and, even though Madagascar is a well-known mineralogical paradise, there were no other references to Fluorite occurrences other than the small crystals included in Quartz from Mandronarivo. A novelty at Sainte-Marie-aux-Mines 2018. 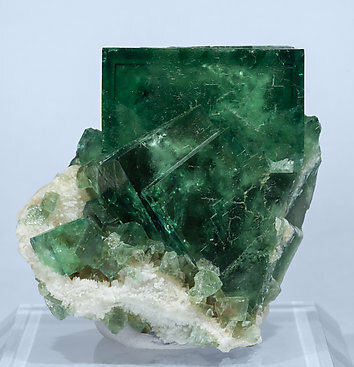 Group of very sharp cubic Fluorite crystals, between transparent and translucent, with an intense green color and very rich with inclusions. 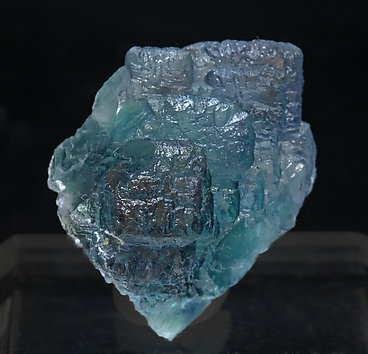 It is from a new locality found thanks to intensive prospective works for Baryte in Morocco, in which accidentally appeared also this Fluorite. 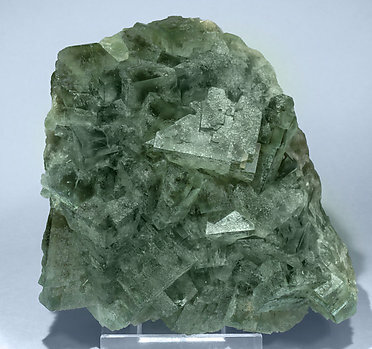 Aggregate, on matrix, of cubic Fluorite crystals that are between transparent and translucent, very bright, with white inclusions, and they have an intense green color that slightly changes to violet in sunlight. The crystals are twinned and the dominant one is flattened, with a curious parallelepiped shape. The sample is with a label of the Gilles Emringer collection that we’ll send to the buyer. 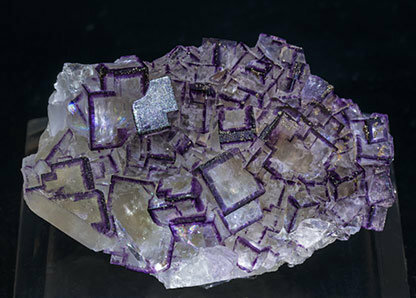 Group of cubic-shaped crystals, clearly beveled by dodecahedron faces, between transparent and translucent and showing an intense and uniform violet color. 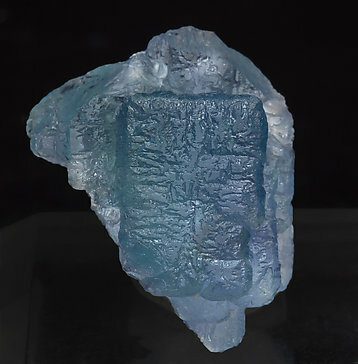 A classic of the Asturian Fluorites. A novelty at Tucson 2018. 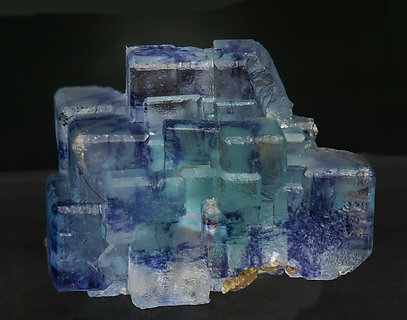 A group of Fluorite crystal cubes between translucent and transparent, with a very intense and deep green color and marine-blue dichroism, clearly visible in sunlight. On a matrix coated by white Quartz. 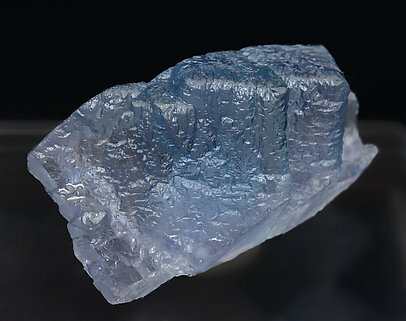 The locality is totally new and, even though Madagascar is a well-known mineralogical paradise, there were no more references to Fluorite occurrences other than the small crystals included in Quartz from Mandronarivo.